ZeroLocker is a clandestine encryption ransomware which is spread across the web using completely fictitious Java installers. These installers can be introduced to you on P2P file-sharing websites and other questionable sources; however, some computer users also find them when browsing legitimate pages. If this is what you have discovered, there is a great chance that malicious adware was installed to open up security backdoors. Needless to say, adware removal is much less complicated, and so you need to do whatever it takes to keep it away. Overall, once the fake installers are executed, malicious files are dropped onto the system. As our researchers have discovered, the seemingly harmless WinUpd32.exe may be responsible for the execution of the Trojan as well. If you do not delete this file timely, ZeroLocker removal will become a big and scary issue. 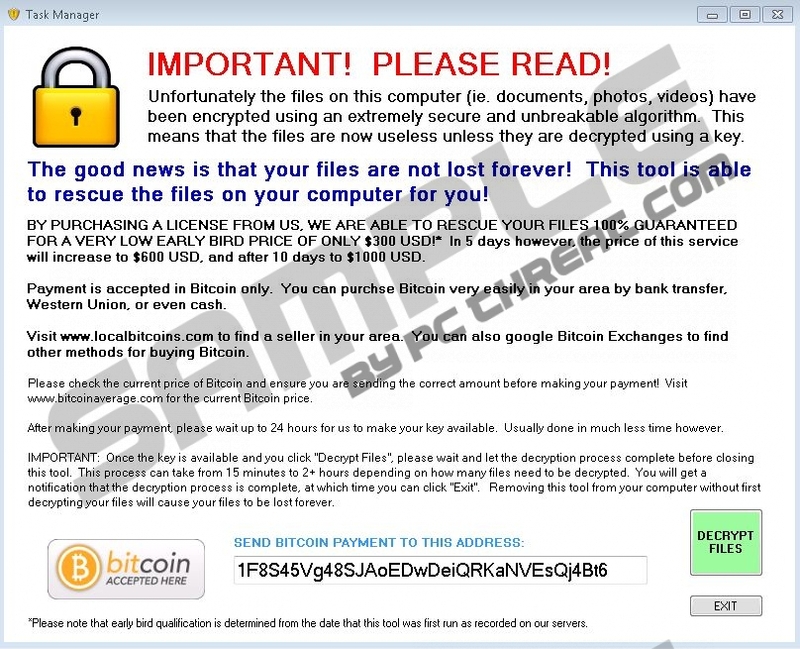 The clandestine ransomware is operated with the help of various different files. However, you need to be extremely careful with their removal. For example, if you delete ZeroLocker files under C:\ZeroLocker (address.dat, log.dat, ZeroRescue.exe), it is unlikely that you will be able to restore the encrypted files. Needless to say, file encryption is the main feature of the infection. It can corrupt shortcuts presented on the Taskbar and your Desktop which may cause trouble connecting to the web and installing automatic malware removal software. Note that browser executables in original folders should not be affected by the infection. Overall, ZeroLocker can encrypt ntuser.dat to corrupt multiple shortcuts and icons simultaneously. After this, cipher.exe comes in action. If this file is not removed, it creates temporary files and overwrites the information of the encrypted files to disable the ability to decrypt them. Even though some computer users decide to pay the ransom of $300, this is not what our researchers recommend. In fact, it is quite possible that you will give up your money just to find that the files remain encrypted. We have some bad news if ZeroLocker has corrupted your operating system. The bad news is that this Trojan can destroy your personal files. If you have backed-up your private files in the past, you should have no more reservations about ZeroLocker removal. Now, if you have no way to restore your files, you may want to think about paying the ransom. As mentioned before, this is not what we recommend; however, the choice is yours, and only you can evaluate your own documents, pictures, and other personal files. Regardless of your choice regarding the ransom, you need to delete ZeroLocker as well. We suggest installing automatic malware removal software because it is equipped to delete all components of this threat. Quick & tested solution for ZeroLocker removal.